Arguably Peugeot's smartest and best-built coupe-cabrio to date, the Peugeot 308 CC has a high-quality cabin design and amazing features that make it a popular choice among renters in the area. You can enjoy a stunning 6.9 L/100km or 40.90mpg fuel efficiency and the safety features you want like ABS, airbags, and more. The Peugeot 308 CC is being hailed as one of the most practical and spacious in its class. It is also a fun and stylish model to use for any transportation needs that you may have. 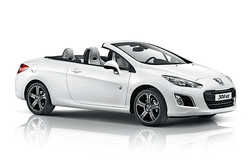 Get it today and see what it is like for yourself and experience the Peugeot difference!